Year one is an introduction to industry standard technologies across multiple media. You will also gain experience in how to communicate ideas using animatics, storyboarding, wire framing and mapping and learn about contemporary media and story-telling. We invite you to try different modes of making and work across mediums. It’s the foundation of your creative practice, both technically and conceptually. In year two you will explore your chosen medium in depth, deconstructing both how it operates and what it means. You will advance your production skills with media production practices and focus on your chosen areas of cross-media specialisation. You’ll learn about media business and the creative economy and how to evaluate and develop ideas for the marketplace. Your final year, year three offers the chance to develop a year-long cross-media creative project. Your student-led team will work with industry mentors through the key stages of planning, preproduction, production and postproduction. There is also focus on preparation for public screenings, exhibitions or presentations and developing your portfolio for career or postgraduate progression. BCMP is taught by people who know the industry, including former staff of Weta Digital, Weta Workshop, Park Road Post, TVNZ and the BBC. BCMP tutors’ film credits include: Avatar, The Hobbit, IronMan3, Planet of the Apes, Babe, Ocean Girl, and 20,000 Leagues Under the Sea. Massey’s College of Creative Arts is ranked in the top 100 by QS University rankings, first in Asia Pacific for design concept. The College of Creative Arts is NASAD approved as Substantially Equivalent. Massey University offers a range of scholarships for high achievers. More information about scholarships for 2019 coming soon. All applicants must meet the basic requirements for university admission. Want to benefit from the College’s extensive industry connections and from studying in a city recognised worldwide for its creativity and innovation in contemporary media brands and production. Want to access industry standard production facilities, and develop expertise for your own portfolio, professional practice or event production. 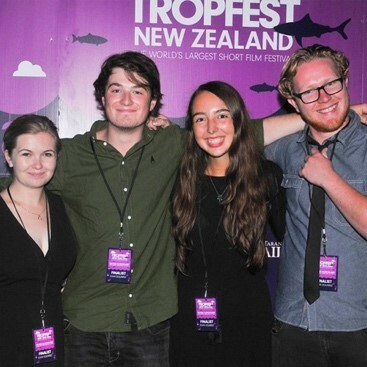 Prestigious short film festival Tropfest New Zealand receives hundreds of entries each year and is open to filmmakers of all backgrounds and experience. So getting shortlisted in your first year of film-making is no mean feat. Part of the Taranaki Arts Festival, Tropfest New Zealand is the Kiwi arm of the iconic Australian festival of the same name. It is a playground for filmmakers to hone their skills and a platform for them to promote work. Into this fray went Massey University first year Creative and Media Production students Christopher Chalmers, alongside a team made up of Kate Lambert, Chris Bird, Matt Wilkey, Caitlyn Parslow and Emily French. The students developed stories that tapped into the skills they had just learnt, working together using industry standard equipment. Two of their films, Timothy (or Hunting for the Dopplemonster) and John Squared, made the final shortlist. Timothy (or Hunting for the Dopplemonster), produced by Christopher Chalmers, featured a mysterious yeti-man living in the woods and stealing people’s lunches. An independent project, Chris says, “Going solo forced me to think my way round solving problems,” he explains. “I made it easy on myself by using lots of static shots, important when you are also acting in the film as well. John Squared was a collaborative project and featured a young scientist who is on the verge of achieving his lifelong dream of genetic replication, when he encounters a problem: his clone believes he is the original. Emily says that all five students tried a variety of roles in the film-making process. “We were so new to the whole process of film-making we each tended to do a bit of everything, the roles were fluid and extremely collaborative,” she explains. John Squared went on to win an award when actor Jordan Rivers, who played the main protagonist, scooped Best Actor at the New Zealand Tropfest Film Festival in February. “Jordon wasn’t there so we all went up on stage and it was an incredibly humbling experience to be a finalist and winner, especially with this audience and up against so many professional people in the film industry,” says Emily. The 21st century is all about cross-media and change. Games, apps, web, film, video, animation, VFX, audio - they are morphing rapidly. The Bachelor of Creative Media Production sets you up for the new world - with your industry experience, critical grounding and practical know-how, you’ll hit the ground running when you graduate and have the flexibility to push the boundaries, re-inventing your craft and your media many times over the course of your career.